"I woke up and heard a strange scratching sound. I turned on the light and s...aw this monster working its way along the wall using his claw," said Mrs Duan of Suining, southwest China. The snake – 16 inches long and the thickness of a little finger – is now being studied at the Life Sciences Department at China's West Normal University in Nanchang. Snake expert Long Shuai said: "It is truly shocking but we won't know the cause until we've conducted an autopsy." 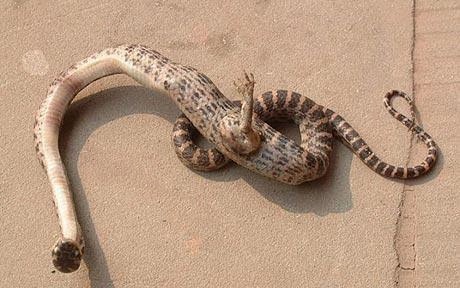 A more common mutation among snakes is the growth of a second head, which occurs in a similar way to the formation of Siamese twins in humans. Such animals are often caught and preserved as lucky tokens but have very little chance of surviving in the wild anyway, especially as the heads have a tendency to attack each other.